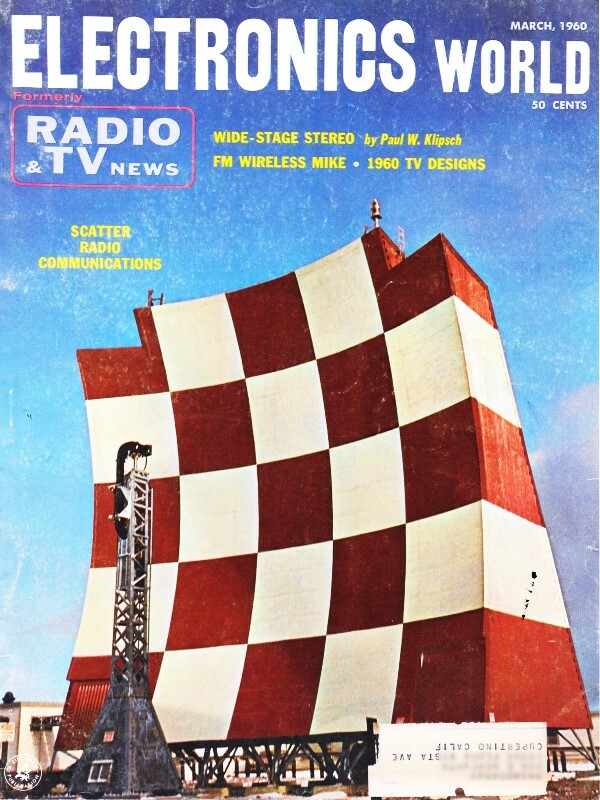 As one born in 1958, it's hard to accept that 1960 news is nearly six decades old. I still find myself thinking of the 1970s and 80s as just a few years ago. 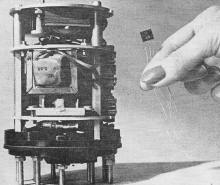 The first integrated semiconductor circuits were still being developed in corporate and university laboratories in 1960. Fairchild announced a year after this Electronics World article appeared their first commercial IC series, named "Micrologic." 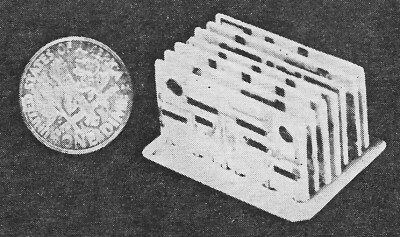 Until then, an integrated circuit meant something like the compact module of interconnected ceramic substrates with printed thick film resistors and miniature discrete components. In other news, Raytheon was ready to deploy their giant ICBM tracking radar system to deal with the emerging global nuclear war threat, while the Martin Company (now Lockheed-Martin) was building guidance systems for our own missiles, and General Electric was building testers for missile guidance systems. Hall effect transducers and super-sensitive TV cameras got honorable mention as well. 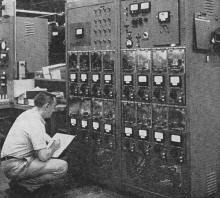 The first model of a complete adder circuit for use in a ballistic missile computer is shown full size in the photo. The unit, made up of 7 ceramic-plate circuits, has been reduced by fifty times in volume over the smallest package that has been made with conventional parts. Some 85 components (resistors, capacitors, and transistors) are in the 1/2" x 1/2" X 1" package. All components except the transistors are presently available in commercial quantities from Aerovox Corp., and the transistors will soon be available. Ceramic base plate circuits may be interconnected as shown or contacts at one or more of the edges may be used with special connectors. The whole unit can be hermetically sealed if required. This huge unique radar, designed to track ICBM's at a distance of thousands of miles, will be developed for the Advanced Research Projects Agency by the Raytheon Co. The five-story high antenna, which fires a narrow pincushion-shaped microwave beam from the radar transmitter, weighs 80 tons. The new radar will be one of the nation's longest range precision units. 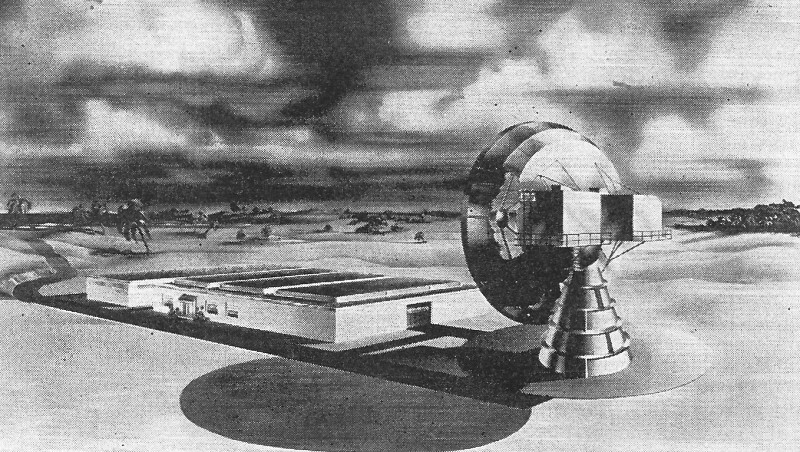 Scheduled for late-1961 delivery, the radar is to be used in conjunction with missile test firings in the Pacific. 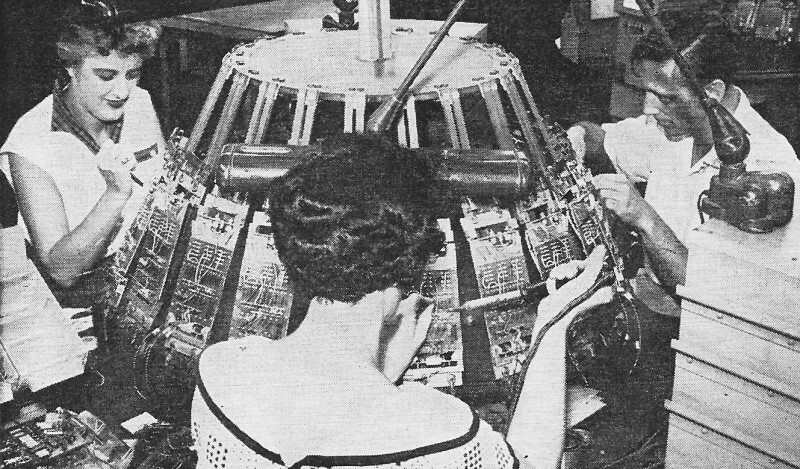 Electron tubes which have key functions in the guidance systems of missiles such as the "Jupiter" and "Atlas" undergo a rigid testing program at General Electric's power tube plant at Schenectady, New York. Test operator is shown checking microwave triode tubes that are undergoing a 500-hour pulsed life test under actual operating conditions. Tubes are checked every 48 hours for power output. The complete testing procedure lasts for some 500 hours. A new super-sensitive TV camera tube, type GL-7629, has been released by G-E. The new image orthicon is physically and electrically interchangeable with a standard camera tube, but it requires from 1/10 to 1/20 the light needed by standard tubes now in use. It can produce usable pictures at one footcandle of illumination. 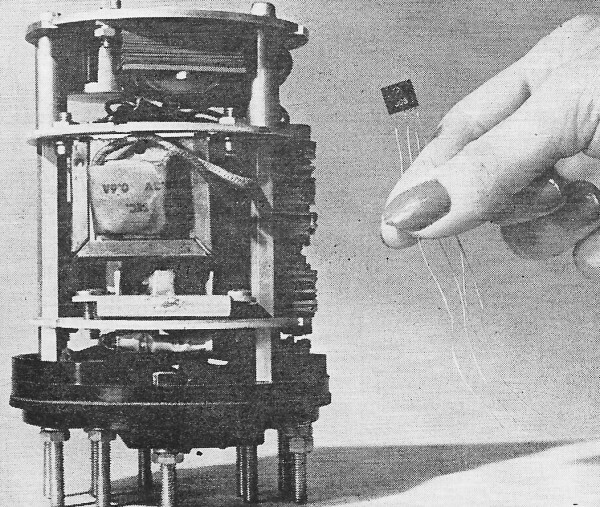 Photo shows the same scene televised with a standard orthicon (left) and with the new tube (right). Tube shows great promise in color work. This new rotary wheel has replaced the standard assembly line workbench in assembling small missile electrical and electronic components at The Martin Co. The wheel has 24 assembly positions and automatically rotates clockwise at a predetermined rate as three operators, working as a team, assemble components (in this case demodulators). A power-operated rotary switch permits remote control of special electrical circuits for stepping, counting, and selecting. Hall Effect refers to the generation of small voltage due to the displacement of positive or negative charges within a material in a magnetic field. Employing this principle, Westinghouse's new Hall multiplier is employed as a power transducer, being used to convert a.c. watts to a d.c. millivolt control signal. This signal may be applied to a control device or to a telemetering transmitter. The new transducer has a much higher speed of response than the thermal converters usually employed.